So i had a few hours fishing one evening on a local park lake last week as i felt the need to get the tackle out. It had been scorchio for the week previous with most days getting close and even hitting 30 degrees but i just fancied a quick and easy trip with the chance of having my string pulled.. The temperature was still in the mid twenties when i got to the banks of this water and started to walk down the side i wanted to fish as the wind would be over my shoulder here and not effecting the water for a good 20 yards out, just how i like it for floater fishing. Unfortunately most swims on this side were taken by day anglers, a very loose term for them, so i walked around to the other side with where the wind was in my face. I was particularly happy about this as although the wind was warm it was also quite strong and i try not to use floats when i fish on the surface. Well i catapulted a few pouches of mixers out as far as i could whilst i set up my gear with a Korda surface float and just as i finished tying the hook on i noticed a big old pair of lips nick a stray floater 3ft from my feet. "Oi Oi says i, whats all this then." I flicked a few more mixers along my margins and within a couple of minutes a few carp started to slurp them down. Of came the controller and with just a size 8 Fox Floater hook and a pellet band i dropped my bait in front of the next carp i saw. With an almighty boil my bait was taken and my Sonik stalker rod was nearly wrenched from my hands. After a spirited fight of a few minutes my first carp was on the mat. I didn,t weight the fish as i hadn,t brought my scales but it was a scraper double mirror, good size for this water as its teeming with pasties. There was a willow to my right with a big clear spot beneath it and i had noticed a couple of rises there so thats where my bait went next. After a couple of failed takes another mirror carp fell to my oiled chum mixer. 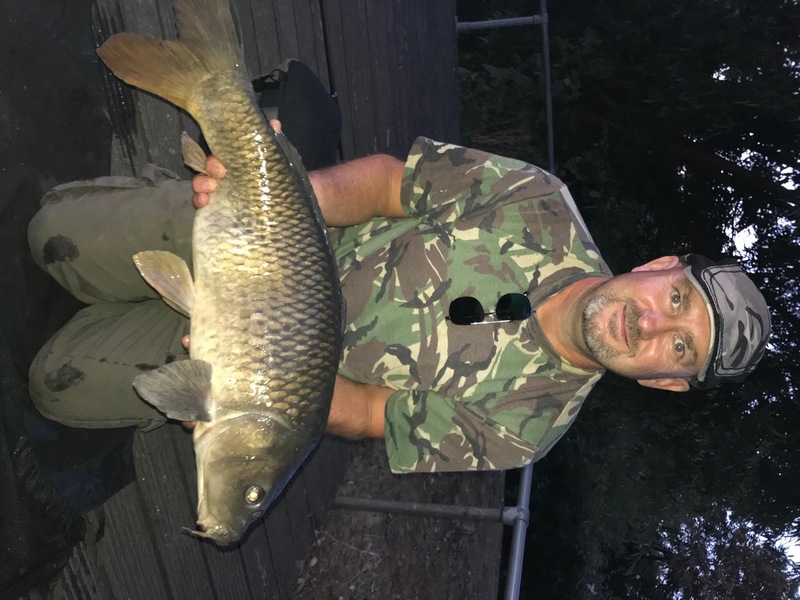 After a hard fight beneath the willow i managed to net the beast and was surprised at it only being a low double figure fish, thought it might of been bigger as it fought like a goodun. Another swim move but with less action saw me living dangerously and hanging the bait over the top of a branch as the fish were a bit spooky here, i think they were actually the same fish from the previous swim that had been patrolling between the two areas via the bush which seperated them. After a frustrating half hour a common, again a scraper double, slurped down my hookbait and tried to escape beneath the bush it had been hiding under. Walking along the bank away from the bush with the rod tip held below the water surface with steady pressure applied soon had the fish out of the danger area and into open water. Another good scrap for a few minutes and it was in the net. I moved around to a vacated swim on the opposite bank just as the sun was getting low and proceeded to fire out some more mixers and after 10 minutes or so i got the fish feeding really well. These carp were further out in the open water though, just within casting distance of my freelined mixer, but everytime i cast to a few showing fish they would bugger off to the other side of the swim. This got really frustrating until i could barely see my bait in the gloom and just as i reeled in to pack up i saw a bigger boil than normal some ten yards away from where my mixers actually were. A quick cast there just for the hell of it resulted in a right old tussle with what turned out to be a lovely common, although it had a bit of a gammy mouth, around the mid double size, largest of the trip.